When it comes to DJ software, your choices include household names, underground favorites, and open source extravaganzas. With all this variety, it can be difficult to tell which is the right software for you. You’ll hear terms like ‘session view’ and ‘sampler’ tossed around and it can make the whole process seem daunting. But with a little research, there’s no reason why you can’t start mixing the tracks of your dreams today. Whether you’re a beginner or a seasoned veteran, we’re here to help you find the package that’s right for you. 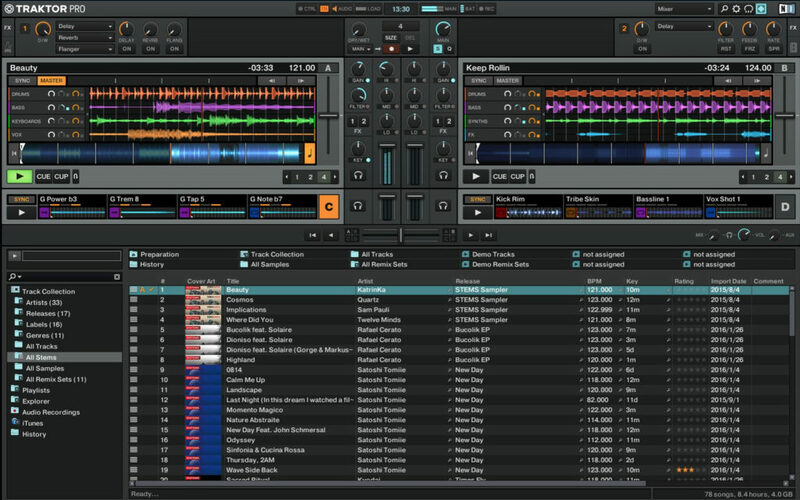 Take a look at the best DJ software available today. If you’re looking for a safe pair of hands in the world of DJing, there’s no program like Native Instruments Traktor Pro. With more than 10 years in the game, this platform has risen to popularity because of its reliability and ability to create a diverse range of music. Amateur and professional users will be pleasantly surprised by the versatility of the onboard Sample and Remix Decks. There’s also a state-of-the-art analytical tool that breaks down the key and beat of your music. One particularly nice touch is the colored waveforms feature, which allows the user to differentiate between high and low frequencies through a jazzy visual color display (Which makes life easier when mixing complex tracks). Native Instruments is currently available for $99. In the world of DJing, few companies are more famous than Pioneer. Originally Rekordbox was designed to use with Pioneer music players but it’s now morphed into a full-blown mixing and sampling suite. The program boasts a respectable four decks, supported by master effects, an eight-part sampler, and a beat slicer. The visual pads are easy to use and add a lot to the overall feel of mixing. If you’re lucky enough to have an extra monitor you can even move your library to one screen. That said, the preferences screen can be very confusing to navigate at times and you’ll need a glass of water to cool down if you’re tweaking them for a while. Dj Rekorbox can be yours for $129. Whilst Ableton Live not a pure DJ software platform, Ableton has certainly developed a reputation as one. DJs across the world have been using Ableton’s Session View to create blistering live sets. The user interface makes it easy to launch audio samples in sync as well as muting unwanted sections on the go. Likewise, the program’s versatility as DAW can add an extra layer of production to supplement your live sets. There are hundreds of effects in the standard version (Thousands if you opt for the suite) and packs are regularly released so that you can tweak your tracks with new tools. 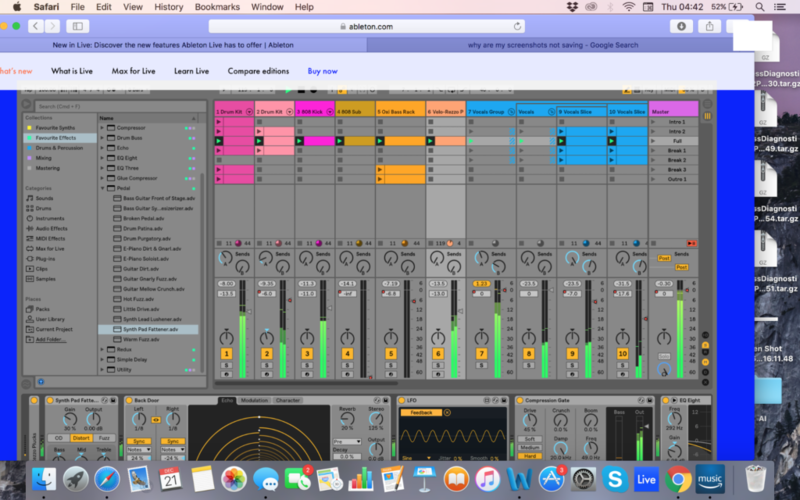 While there is certainly a learning curve with Ableton, you’ll reap the rewards once you master how to navigate the session view effectively. Ableton Live starts at $99. 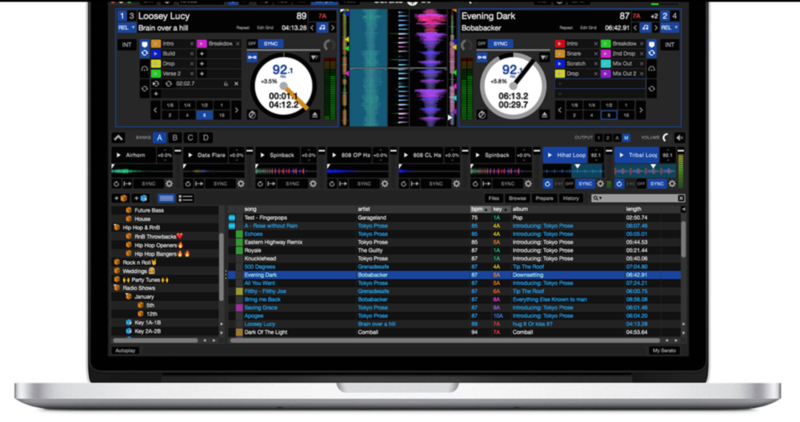 While not as famous as Pioneer, Serato DJ is one of the leading DJ software packages on the market today. On the main screen, you’ll have all the basic info you need, with your decks, BPM, time scales, pitch, and track progress all kept in clear view. 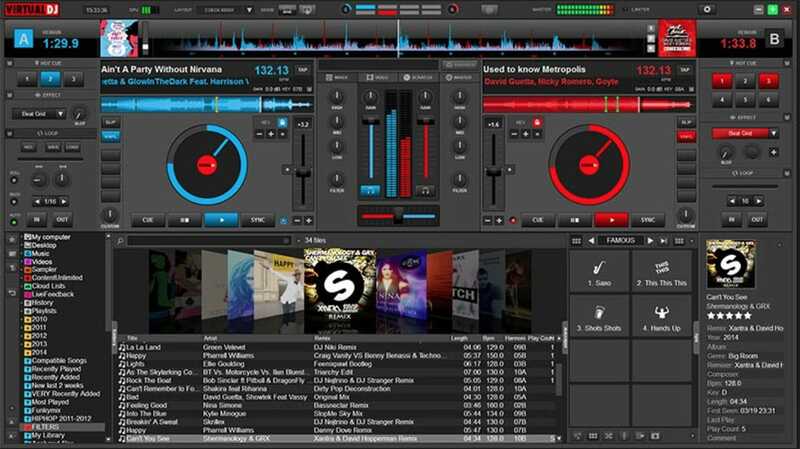 You can also switch between mixing on 2 or 4 decks. One of the biggest advantages of Serato is its massive onboard library (which dwarfs every other provider on this list!). In terms of MIDI, users have access to a clear virtual panel so that they can interact directly with the program and create their own music. DJs looking to be extra strict with their timing can also make use of Quantize Mode to ensure that each segment begins right on the beat. Serato is available for a respectable $99. If you’re looking to dabble in the DJ world but you don’t have the budget to spend on an expensive suite, Mixxx is the product for you. This free open-source DJ software allows users to crossfade tracks, detect BPM, run loops and adjust the overall EQ. In other words, everything an amateur DJ could need to hit the ground running. This nifty open source program is also available to Windows and Mac users as well. Mixxxx now has five main effects: Flanger, Fliter, Echo, Reverb, and Bitcrusher. Just be aware that the mix does not have the quality or nuance to it that many other DJ software packages have on this list. You can download Mixxx for free on their website. 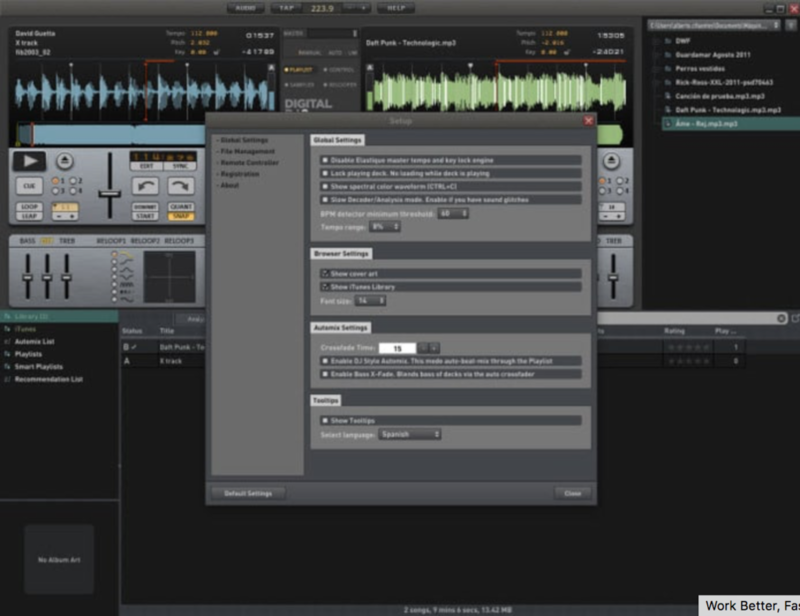 The user interface is simple to use, and you can drag and drop tracks into the main screen to start mixing. To assist your mixing journey, the onboard app will suggest similar-sounding tracks to the one your playing. The song manager interacts with your iTunes library (if you have one) to search through your tracks for similar songs. The song manager makes it much easier for beginners to navigate the software and start playing their favorite tracks without too much of a learning curve. While it lacks the advanced depth of some of the other competitors on this list, it’s a good entry-level platform into the world of music sampling. Download the trial version of Magix for free here. Virtual DJ has caught a lot of flak for being a light option with a poor user interface and overall feeling of clunkiness. 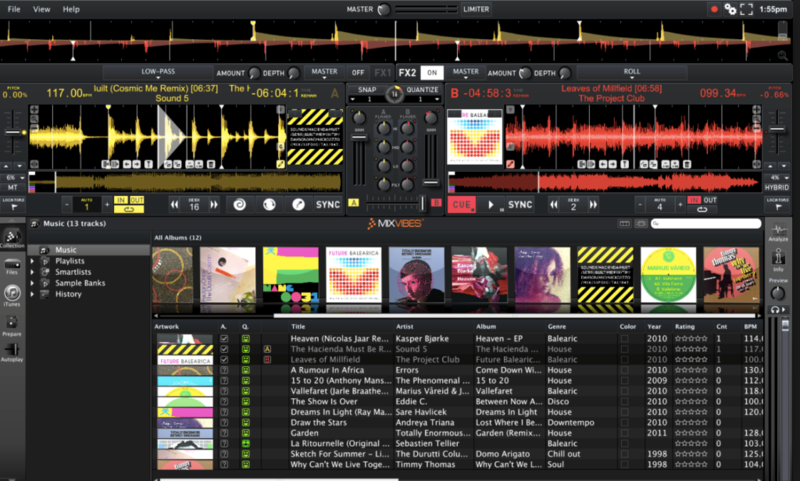 However, Virtual DJ 8 looks fluid and contemporary. (And it now supports retina displays, unlike most other competitors!) On the main screen, you’ll have both your decks, with an EQ section in the middle and the crossfader located below. 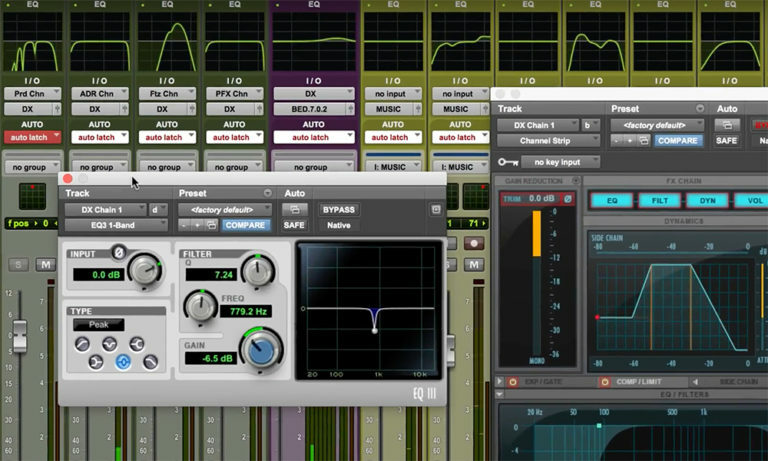 All you need to do to start mixing is drag and drop. If you want to go old school, you can open up the scratch window to view your waveforms and get that distinct scratch sound. 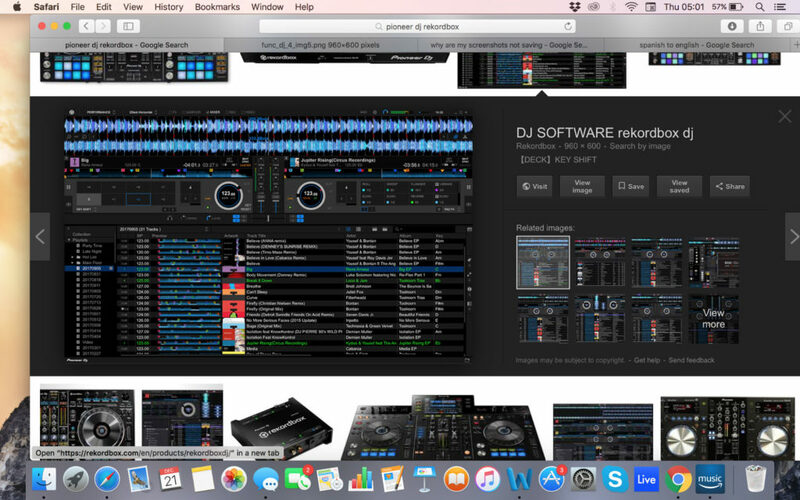 VirtualDJ is compatible with most hardware, making it one of the most versatile software packages on this list. 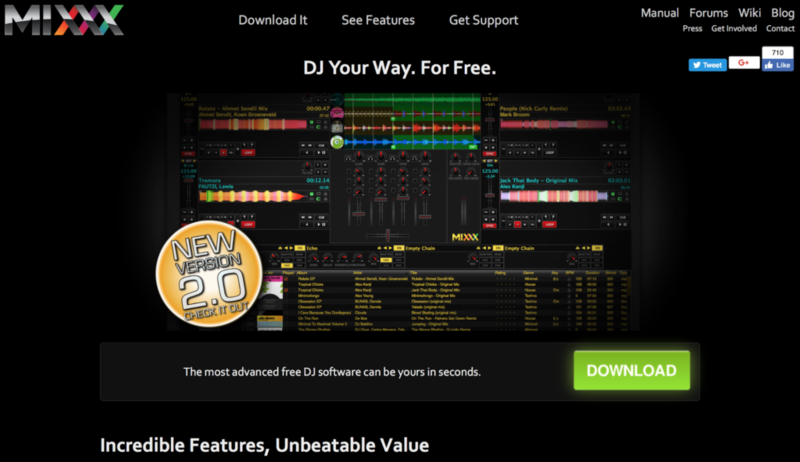 Virtual DJ Pro can be downloaded here for $299 or $19 a month. MixVibes Cross DJ make not have the same recognition as Pioneer but it’s been making waves in the DJ community. In terms of core layout, you can choose between 2 or 4 decks, with a selection of different players and samples to choose from as well. There are two main FX units and you can choose between 14 different effects. One of the biggest advantages of MixVibes is the excellent BeatGrid Editor which helps to resolve any issues with BPM. You can also import from iTunes and connect a SoundCloud account to load up some of your own tracks. MixVibes is also much cheaper than many of its competitors but it still holds its own phenomenally well. MixVibes Cross DJ can be picked up for €49 (about $60 at the time of publication).